Spoofy design for cool birders. Label tape reads Birda's Paradise. 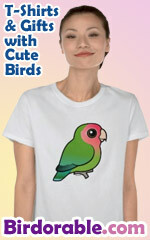 This unique design makes a perfect gift for birders, bird lovers and birdwatchers. No gangsta's allowed though.